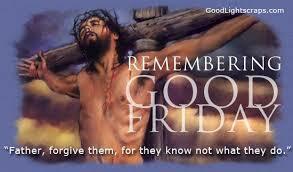 Good Friday, is the Friday in Holy Week. On this day the Church remembers the anniversary of the Crucifixion of Jesus Christ. It is one of the oldest feasts in the calendar. From the earliest times the Christians kept every Friday as a feast day. The origin of the term Good is not clear. Some say it is from "God's Friday" (Gottes Freitag). Sometimes, too, the day was called Long Friday by the Anglo-Saxons; so today in Denmark. Good Friday, is the Friday before Easter Sunday. It celebrates the Passion and Death of our Lord Jesus Christ on the Cross. This falls on the 2nd day of the Easter Triduum after the Mass of the Lord's Supper on Holy Thursday. During the liturgy the account of the Passion according to the Gospel of John is read, there are intercessory prayers, and the faithful venerate the Cross by kissing it. The Liturgy ends with the distribution of Holy Communion. There is no Mass celebrated on Good Friday Hosts that were kept from the Mass of the Lord's Supper on Holy Thursday are distributed. The service on Good Friday is very solemn; the organ is not played, and all vestments are red or (Traditional Latin Mass) black. Fasting and Abstinence is observed on Good Friday. Catholics over the age of 18 and under the age of 60 are required to fast, this means that they can eat only one complete meal and two smaller ones during the day, with no food in between. Those who are over the age of 14 are required to refrain from eating any meat, or any food made with meat, on Good Friday.